The aim of the study is to reconstruct the second stage in the evolution of Ancient Greek ontology from the point of view of the late-Heideggerian concept of the Event (Ereignis). 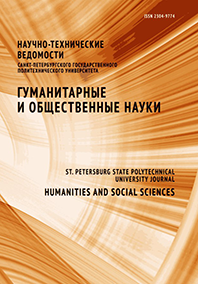 The study is based on the principle of the unity of the historical and the theoretical. A combination of methods of dialectics, phenomenology, hermeneutics and historical reconstruction is used. After Socrates, the history of Ancient Greek ontology is determined by the event of the dispute between Plato and Aristotle. This debate absorbed in a generalized form all the preceding discussions about Being, and also set the direction and scope of subsequent disputes. The event in Ancient Greek ontology is not limited only to the temporal characterization of the historical process, but acquires the signs of an ontologically understood myth. The dispute between Plato and Aristotle marked the boundaries of the ontological paradigm of antiquity, and also determined the genetic code for the development of all subsequent philosophy. The results may help a deeper understanding of historical expediency, as well as clarify the role of ontological knowledge in the evaluation of the driving forces of history.